The RSVP 3 exhibition by Zoe Manders has gone up in Whitehawk Library. RSVP 3 is the final quilt in the trilogy of photo quilts for Evolving in Conversation. Like the previous 2 pieces, it aims to document the experience of the participants, this time in the Skills Share Workshops at Hangleton, Hove and Whitehawk. Evolving in Conversation: Cohesion Showcase Day from Brighton & Hove Libraries on Vimeo. Relive the highlights from our third and final Evolving in Conversation showcase day celebrating the culmination of the Cohesion phase of the project. Performances by Pestiferous, Rosie Heafford from 2nd Hand Dance and talks with Rosemary Lee and our Dance workshop participants. Workshops by Zoe Manders. Kay Walton, and Michael Parker. Keep up to date with our latest news by visiting our blog at www.evolvinginconversation.co.uk or by following us on Twitter and Facebook @BHLibraries #EinC. On 29th June, Hangleton & Knoll Project’s women’s group experienced Charlotte Spencer’s Walking Stories. 15th June: Visit The Library Forest at Jubilee for a limited time only! The trees will be headed back to their roots soon, so come down and contribute your own message. Also why not visit the RSVP and RSVP2 exhibition up until the end of June. 5th June: On 2nd June, Evolving in Conversation the Evolving in Conversation project was brought to schools, with Charlotte Spencer running a choreography and movement workshop at Blatchington Mill School and College. The purpose of the workshop was to allow the students to explore movement and to think about dance and choreography in a new way. They were encouraged to observe small movements made by their classmates and were supported by Charlotte to turn these into a choreographed routine which they performed at the end of the workshop. Students were also encouraged to reflect on how the workshop was run by Charlotte and recorded their thoughts on how they might run a workshop themselves. 3rd June: Free movement and choreography workshops exploring how we can change the world through our bodies. Suitable for all ages and skill levels. 29th May: Full schedule released for tomorrow’s showcase day. Join us! All activities are free. All welcome. 10am onwards.Throughout the library spaces. Visit the exhibitions including: RSVP new commissioned work by Zoe Manders. B.fest, youth arts festival exhibits:· How Can Individuals Make Society Change? Part of the Evolving in Conversation project.· Youth Voice! by Disabled Youth Council, Children in Care Council and Brighton & Hove Youth Council.· Shoot at Will by the #Cameraheads, Photoworks Photography Club.· Brighton Banner by Whitehawk Art Group, Brighton & Hove City Council Youth Service.· My Space created via 1:1s through Individual Support and FAB Group.· Head Space by Moulsecoomb Art Group, Brighton & Hove City Council· Words on the Wing by local primary school pupils and poet Kay Walton. 10-11.45am Drop in. Engagement Hub. Workshop with Zoe Manders. Your chance to contribute to new work to be ‪exhibited at Jubilee Library inspired by the theme How Can Individuals Make Society Change? and the exhibition piece RVSP. 11am onwardsDrop in, all day. Participate in a library audio trail. Collect your trail kit from library staff. #Cameraheads invite you to take part in:· Photomusic by Ruben F. Brett· Lucky Dip by Ava, Olive and Josie#Cameraheads are a group of young photographers working with artist educator Lindsey Smith as part of Photoworks Photography Club.Share your thoughts with The Library Forest. 11am start.Book your place in person from 10am on 30th May. Meet at the stage. Experience Charlotte Spencer Projects Walking Stories.This audio trail lasts approximately 1 hour and will take you out of the building and into the city beyond. You will finish back at Jubilee Library. A walk in the park becomes an interactive and completely immersive audio experience. Please note places are limited. It is essential to book your place in person from 10am. 11am-12.30pmDrop in. Children’s Library. Words on the Wing poetry workshop with Kay Walton for children and their families/carers. Creative writing and origami. Add your work to the exhibition. 11am-12.30pmDrop in.Engagement Hub. Poetry in Motion poetry workshop with Michael Parker for everyone aged 13+. Creative writing and activities. 11.15-11.45amThroughout the library spaces. Pestiferous perform The Librarians. Something unusual is happening in your local library. The books take on a life of their own and lead you to explore what lies within the pages. Expect dance, comedy, poetry and lots of literacy fun. 12.30-12.45pmMain stage area. Second Hand Dance perform Teachers. Rosie Heafford is developing new work using personal stories of and about teachers. This duet performed for the first time is about teaching– its importance in society, its effect on our future and the people involved in it. 12.45-1.30pmMain stage. In Conversation…Commissioned artists and project participants discuss their experiences of the Evolving in Conversation project and how they responded to the themes to create new work or share their existing pieces. 1.30-3pmDrop in. Engagement Hub. Meet Rosie Heafford from Second Hand Dance and contribute to the research being gathered to develop her new work Teachers. 1.30-3pmDrop in. Engagement Hub. Workshop with Zoe Manders. Your chance to contribute to new work to be ‪exhibited at Jubilee Library inspired by the theme How Can Individuals Make Society Change? and exhibition piece RVSP. 1.30pm start.Book your place in person from 10am on 30th May. Meet at the stage. Experience Charlotte Spencer Projects Walking Stories.This audio trail that last approximately 1 hour will take you out of the building and into the city beyond. You will finish back at Jubilee Library. A walk in the park becomes an interactive and completely immersive audio experience. Please note places are limited. It is essential to book your place in person from 10am. 2-3pm Engagement Hub. #Cameraheads invite you to take part in:Pass the Parcel by Ava Aubrey Conboy.Be inspired, bring your camera or borrow one, get involved.#Cameraheads are group of young photographers working with artist educator Lindsey Smith as part of Photoworks Photography Club. 2-3pm Find us at the trees. Explore the theme How Can Individuals Make Society Change? with Charlotte Spencer and guests. 2.10-2.35pm Throughout the library spaces. Another chance to see Pestiferous perform The Librarians.Something unusual is happening in your local library. The books take on a life of their own and lead you to explore what lies within the pages. Expect dance, comedy, poetry and lots of literacy fun. 3.15pmMain stage Rosemary Lee in conversation with Charlotte Spencer.Choreographer, performer and director, Rosemary Lee, discusses the themes of the Evolving in Conversation project and her work. There will be an opportunity for audience questions. Use #getyourdancingshoeson and #whatsyourmove to see our great competition entries! Last night, Jubilee Library hosted the launch of B.fest 2015. The library was open in the evening for young people to take part in a range of fun activities and find more about the services on offer to them across the city. Evolving in Conversation was there launching ‘The Library Forest’ exhibition. Visitors were invited to write on a tag about someone who had inspired them or had an impact on their life in some way and tie it to the trees. You can see the exhibition up on display until the end of June. 1st May: At the end of April we held free two taster sessions to have the opportunity for participants to try our movement workshops with Charlotte Spencer. The weather was beautiful and a great time was had by all. We are now booking people into places for more workshops during May. Get in touch through the details below..
0th Feb: We hosted the showcase day to present the work and encourage conversation about writing and changing society. To celebrate, we invited some of the writers along to speak in conversation with Georgia Metaxas about their experiences of working on the project. it was fascinating to find out more about their process, what inspires them and why they write. We hope if you attended that you came away inspired to explore your creativity! 27th Jan: You are invited to our next showcase day! 25th Jan: SNEAK PEAK! In our new video of the creative writing workshops, participants read out a small excerpt of their work. Join us at our next showcase day on Sat 7th Feb at Jubilee Library to see all the work in full and the inspiration behind their writing. Evolving in Conversation – Conflux Workshops from Brighton & Hove Libraries on Vimeo. 5th Jan: NEW VIDEO! Did you attend our first Showcase Day on Saturday 18th October? You can now relive the highlights (or see what you missed!) right here! Learn more about the first phase of the Evolving in Conversation project ‘Collaboration’ and get involved in the conversation. We want to hear your favourite parts of the day… tweet them to us at @BHLibraries using #EinC. Perhaps you enjoyed hearing the young people talk with Gina Lundy about their experience of learning photography as a new skill? Or the fascinating talks by Catherine Hall and Chloe Dewe Mathews? 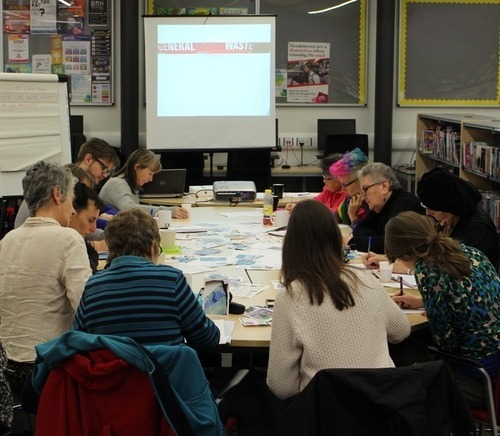 Or did you take part in one of our workshops – creative writing or bookmaking? Don’t forget our next showcase day will be taking place on Saturday 7th February – stay tuned for your chance to get involved. Evolving in Conversation: Collaboration Showcase Day from Brighton & Hove Libraries on Vimeo. 16th Dec: NEW PODCAST! Visit our mixcloud page to hear not one, but three podcasts from our first Evolving in Conversation Showcase Day. Hear how the photography workshops changed young participant Ava’s view of the world, the fascinating research process by Catherine Hall for her latest book The Repercussions and in depth behind the scenes of Chloe Dewe Mathew’s latest project Shot at Dawn and her commissioned work for Evolving in Conversation, responding to the book A Clockwork Orange by Anthony Burgess. 16th Dec: In this week’s final workshop at Portslade Library, participants will be writing alternative endings or afterwards to novels chosen from the Writes of Passage booklist. This is a list of ‘life changing’ books compiled for World Book Day. You can view them all here: http://www.worldbookday.com/writes-of-passage/. Which is your favourite? What would you add to the list? 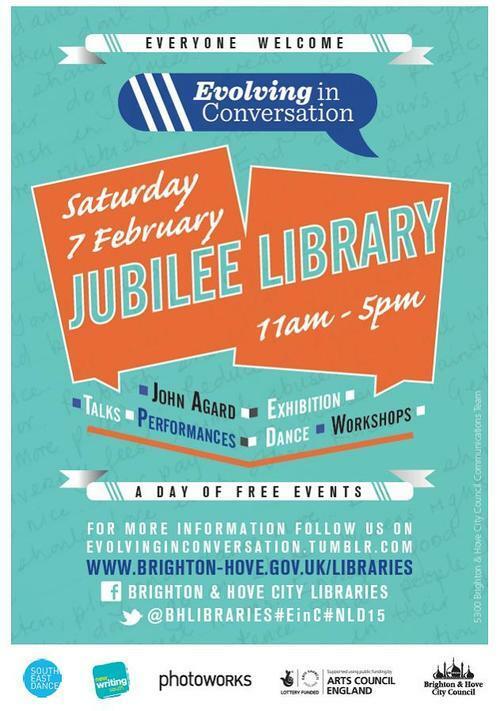 Tweet us @BHLibraries or e-mail us at evolvinginconversation@brighton-hove.gov.uk. 15th Dec: The writers are announced! 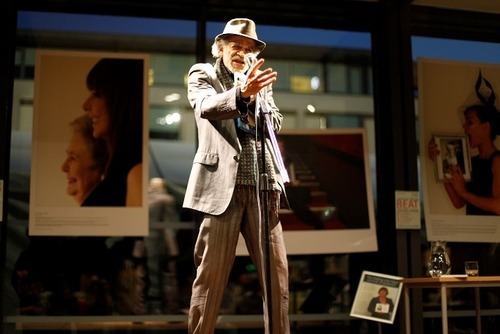 Writers John Agard, Rosy Carrick, David Sheppeard, Alexandra McAllister and Steven Lancefield have been commissioned by Brighton & Hove Libraries to produce work to the same brief as the participants. Visit the ABOUT THE WRITERS tab above to find out more about them. Stay tuned for updates on National Libraries Day, Sat 7th February 2015, to find out how you can meet the writers. 20th Nov: And the workshops in Portslade Library have also begun! Participants passionate about writing will be sparking new ideas and creating characters through short monologues. 19th Nov: Today is our first Creative Writing Workshop at Whitehawk Library! Participants will be exploring the theme ‘How Individuals Make Society Change’ and responding to images taken by the young participants in the first phase of the project. 16th Nov: Welcome to our latest news page! Check back here for regular updates on the project and find out how you can get involved! Don’t forget to tweet us your thoughts, comments and opinions @BHLibraries using #EinC.